Up until 2009, influenza co-infections were rarely reported, and until then most of the literature had only dealt with Influenza A & B co-infection, not two different A strains. The arrival of a new H1N1 pandemic virus in 2009, however, led to extensive testing - and that revealed that Influenza A co-infections were more common than previously believed. In 2010, in EID Journal: Co-Infection By Influenza Strains, we looked at a study in New Zealand during the opening months of the 2009 pandemic that discovered at least 11 co-infections (out of 1,044 samples tested) with the older seasonal H1N1 virus and the newly emergent pandemic H1N1 virus. The authors stated that the rate of co-infection could actually be higher, since samples were not checked for any other flu strains such as H3N2 and influenza B. Since then we've seen additional reports of influenza A co-infection, including human-avian flu combinations. 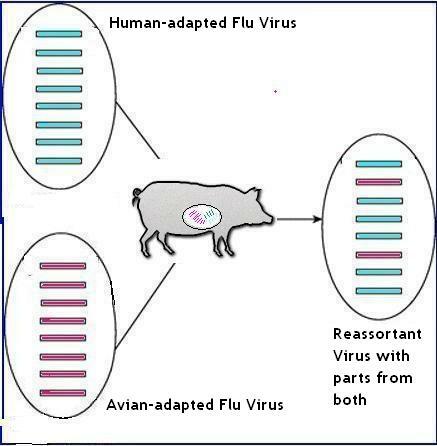 As influenza co-infection in birds, pigs, and other mammalian hosts can sometimes lead to the creation of a reassorted virus - a new hybrid with genes from both parental strains - we give these reports a good deal of attention. While viable reassortant viruses aren't detected often, we've a couple of examples to look at. Last November in J Clin Virol: Influenza Co-Infection Leading To A Reassortant Virus we looked at just such an occurrence. A co-infection between seasonal H3N2 and H1N1pdm09 in a 3 year old Cambodian boy which led to a new, reassortant H3N2 virus. In 2011 we saw a similar co-infection in Canada that led to the creation of a unique hybrid reassorted virus (see pH1N1 – H3N2 A Novel Influenza Reassortment) in a 16-month old boy from the Greater Toronto Area. In the summer of 2013, in the Lancet: Coinfection With H7N9 & H3N2, we saw the first evidence of co-infection with the newly emerged H7N9 virus and a seasonal flu virus in a human host. The case involved a 15-year-old boy from China - while two influenza viruses were isolated from the same patient - no reassorted virus was detected. 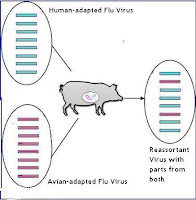 Once again, in 2014, we saw a report (see EID Journal: Human Co-Infection with Avian and Seasonal Influenza Viruses, China) of two H7N9 co-infections, one with H1N1pdm09, and the other influenza B. Again, no reassortant virus was detected. Upping the ante today, we've a recent EID Journal report on another H7N9 - H1N1pmd co-infection from 2014, with the added twist that both strains appear to have been nosocomially transmitted to an immunocompromised patient in a hospital ward in China. A nosocomial cluster induced by co-infections with avian influenza A(H7N9) and A(H1N1)pdm09 (pH1N1) viruses occurred in 2 patients at a hospital in Zhejiang Province, China, in January 2014. The index case-patient was a 57-year-old man with chronic lymphocytic leukemia who had been occupationally exposed to poultry. He had co-infection with H7N9 and pH1N1 viruses. A 71-year-old man with polycythemia vera who was in the same ward as the index case-patient for 6 days acquired infection with H7N9 and pH1N1 viruses. The incubation period for the second case-patient was estimated to be <4 days. Both case-patients died of multiple organ failure. Virus genetic sequences from the 2 case-patients were identical. Of 103 close contacts, none had acute respiratory symptoms; all were negative for H7N9 virus. Serum samples from both case-patients demonstrated strong proinflammatory cytokine secretion but incompetent protective immune responses. These findings strongly suggest limited nosocomial co-transmission of H7N9 and pH1N1 viruses from 1 immunocompromised patient to another. The entire report is lengthy, detailed, and well worth reading. Once again, no reassortant virus was detected. This is, however, the 3rd recent report of nosocomial transmission of the H7N9 virus (see here, and here) out of China. In summary, our findings strongly suggests nosocomial human-to-human co-transmission of H7N9 and pH1N1 viruses between 2 immunocompromised case-patients with hematologic diseases, with no evidence of transmission to others. The deaths of these 2 case-patients might have been attributable to co-infection with pH1N1 virus, delayed initiation of antiviral therapy, and the patients’ immunocompromised status. These findings suggest the need for awareness and early testing for influenza in hematology units and for liberal use of early antiviral treatment if patients exhibit ILI symptoms. Implementing rigorous infection control practices might minimize cross-transmission. Avoiding the use of corticosteroids in patients with infection also needs to be emphasized.